John Sayles has been away from UK cinema screens for a long time. I think Honeydripper was the last of his films to get a UK release back in 2008 . These days the ‘godfather of American Independent cinema’ is mostly based in Mexico it seems, or at least concerned with Spanish-language films. Casa de los babys is an earlier film made in Mexico, partly in English as well as Spanish. The film was never released in the UK but I bought a Region 1 DVD some time ago and finally managed to watch it. I wasn’t disappointed. The ‘House of Babies’ of the title is a seaside hotel ‘somewhere in Latin America’. The country isn’t named but the location for the shoot is given as Acapulco. There are six ‘anglos/gringas’ who have come to this city in the hope of adopting a baby to take back to the US. Sayles has acquired a starry cast, no doubt attracted by his reputation for female-centred melodramas with a political edge. The Americans are Maggie Gyllenhaal, Mary Steenburgen, Marcia Gay Harden, Darryl Hannah, Lili Taylor and the Irish actor, Susan Lynch. The hotel they are staying in is run by the indomitable Rita Moreno. 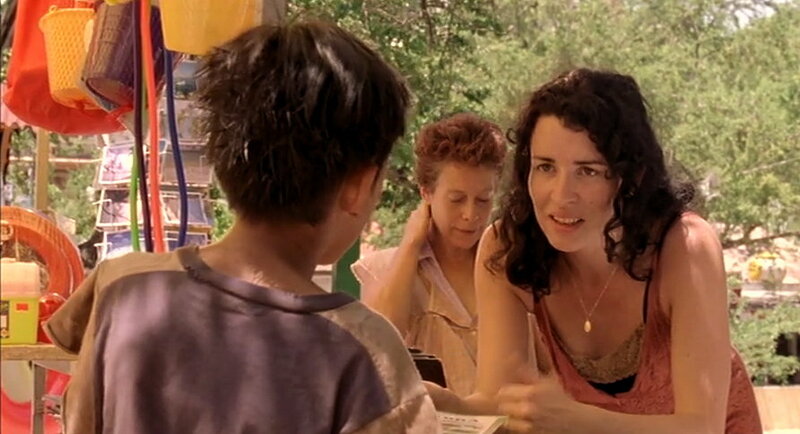 The large ensemble cast is no surprise in a John Sayles film. He often writes screenplays which bring together several personal stories and this film is no exception. The criticism of Sayles’ films tends to have been that, because he usually edits his own films, he allows the blend of narratives to develop into a meandering multi-strand narrative. That’s certainly not the case here. He’s still the editor but the film is a concise 95 minutes and if anything is cut short rather than allowed to dawdle. The focus is not just on the Americans but also on the local characters, a maid in the hotel, the hotel manager’s family, three young boys sleeping on the street, a 15 year-old pregnant girl, a student and an older man desperate to emigrate to Philadelphia (the ‘home of Liberty’ as he explains to the women). Each of these characters shares the spotlight at some point, allowing Sayles to explore the complex relationships between ‘North and South’, ‘Latin America’ and ‘Anglo America’. The six women do not necessarily get along. Nan (Marcia Gay Harden) is the most aggressive towards the locals, while most of the others are, perhaps naïvely friendly (naïve because the don’t speak Spanish), and grateful for the opportunity. Leslie (Lili Taylor) is the most sussed, a Jewish New Yorker and a single woman who speaks Spanish. Skipper (Darryl Hannah) is mistrusted by some of the others and seen as fitness-obsessed. But like most of the women she has a back story to be revealed. I found the film entertaining and rewarding and, typically for Sayles, the narrative plays fair to all the characters, American or Mexican. Audiences might however feel short-changed as this is not a Hollywood film with a neat ending in which we find out which of the women gets a baby. But that’s OK, I think. The purpose of the narrative is to introduce us to the complexities of what adoption means and especially what it means in the power exchanges between North and South. But it also explores what it means for both the childless Anglos and the Latinas who lose/give up their babies. Reading some of the negative comments (which are more than balanced by the positive ones) on IMDb it’s amazing just how prejudiced some people can be. This isn’t in any way a didactic film. Sayles simply offers a number of scenes featuring the different characters and allows us to work out for ourselves what the meanings might be when they are edited together. That might sound like it’s a foregone conclusion but really it isn’t. There is a lot more material on the DVD dealing with the production itself and it’s clear that different people involved in the film have their own ideas about the ‘trade’ taking place. It’s time, I think that some of the UK distributors decided to bring us the more recent John Sayles films on DVD/Blu-ray or download if not in cinemas. We can’t afford to forget what a terrific filmmaker he is – and how different he is to most American filmmakers. Search through the cast list here and you’ll find various actors and crew who have worked with Sayles during the last thirty years and more.